Here is what my Holland Bowl looks like after being used every day for the past year. Yes it does have some cut marks and just a little bit of a green patina from all those healthy greens I eat! This is how my kitchen looks each morning as I am getting ready to chop a salad to take with me for my lunch. This is one of the batch prepped salads from the fridge. I chop the salad the same day I will be eating it. A one pound salad from my Simple Salad Batch Prep Blog Post & Video. Click on the blue highlighted link to see how to batch prep the basic salad ahead for the work week! Then each day you take one of the batch prepped salads from the fridge and chop it the day you are going to eat it. Some people have told me they chop it the night before so it’s ready to grab and go the next morning for work and it’s still good chopped that far in advance. Experiment and see what works for you. My personal preference it to chop it and eat it the same day. 15 inch beechwood bowl for chopping salads. In the background a 15 inch cherry fruit bowl. Here is how it looks after it is chopped using the mezzaluna knife in the 15 inch bowl. Notice how it is reduced in size and nicely chopped. Six inch Holland Bowl Mill bowls in cherry, beech and walnut. For this particular salad I decided to go with a Mexican – Southwest style. After chopping the basic salad I like to add some more cooked and raw ingredients to the salad. These add in items do not get chopped. They add flavor, texture and satiety. Each day I add some kind of starch or legumes to make the salad more filling. This day I went for a diced red bell pepper, frozen corn, Cooked Oat Groats, diced jicama. Juice of one lime and also not shown half of a plantain browned without oil in a ceramic non-stick Scanpan for a few minutes on each side. You can add fruit as well. Adding some fresh fruit either before or after chopping adds a nice sweet freshness. The fruit helps people to adjust to eating these larger amounts of greens. Fresh berries or apple are my favorite fruit to add to the salads. I like to add them after the salad is chopped. With the fruit added you need less salad dressing or vinegar. My Creamy Balsamic Dressing is very popular with the no oil crowd! Even non plant eaters love this dressing. 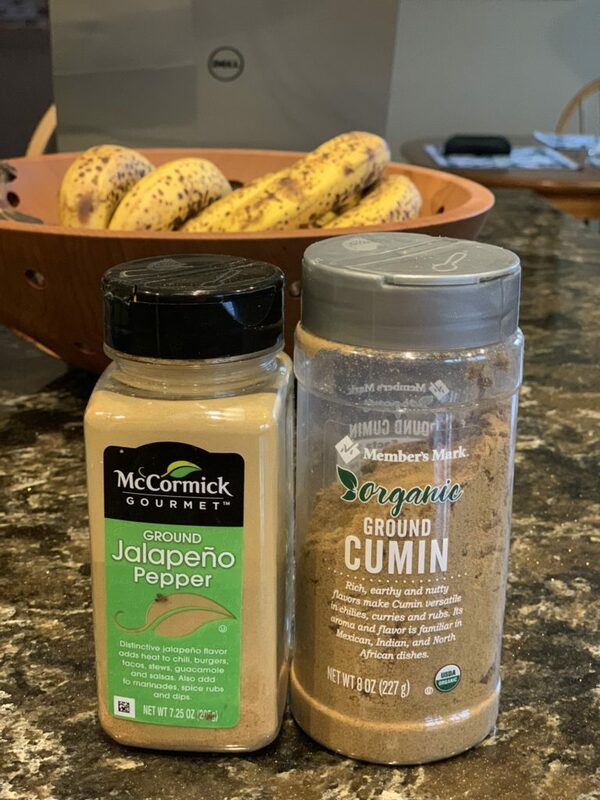 Jalapeno powder and ground cumin add a lot of flavor. 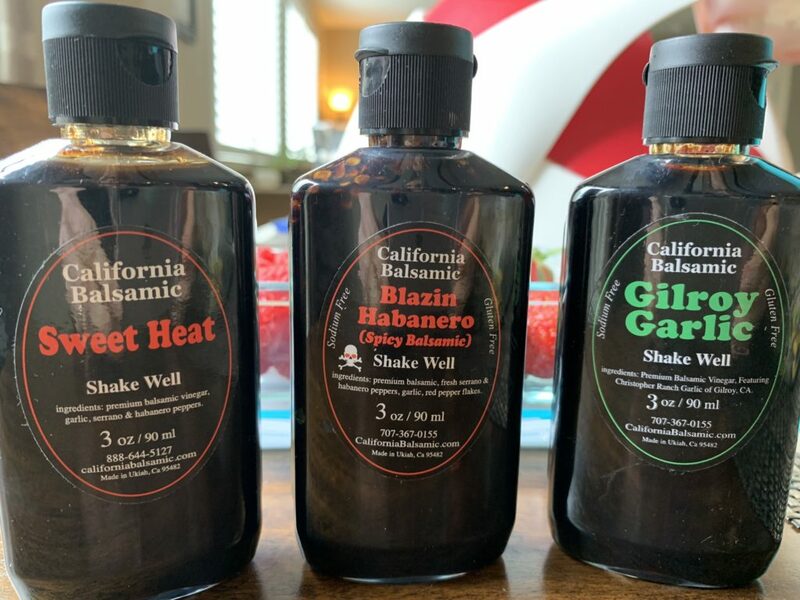 These are three of my favorite California Balsamic Vinegars. See my blog post to find out how to get 2 free sample size bottles with your order. Shown here are the 3 ounce travel sizes perfect for air travel! Chop the one pound salad first. Then add in the rest of the ingredients and stir them in – no more chopping. It’s fun to stir in some cooked and raw ingredients and to use flavored vinegars, fresh citrus juice or no oil salad dressings like my Creamy Balsamic Dressing. *You can use brown rice in place of the oat groats. You can add beans to the salad. You can use salsa instead of the vinegar. 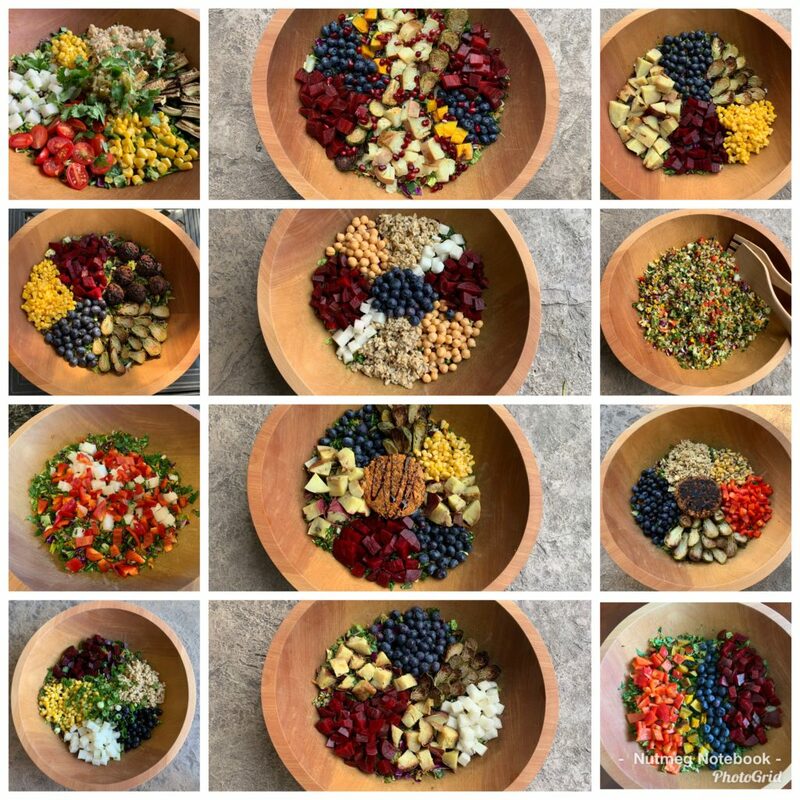 There are so many different combinations and flavors that you can create a different salad everyday of the week! 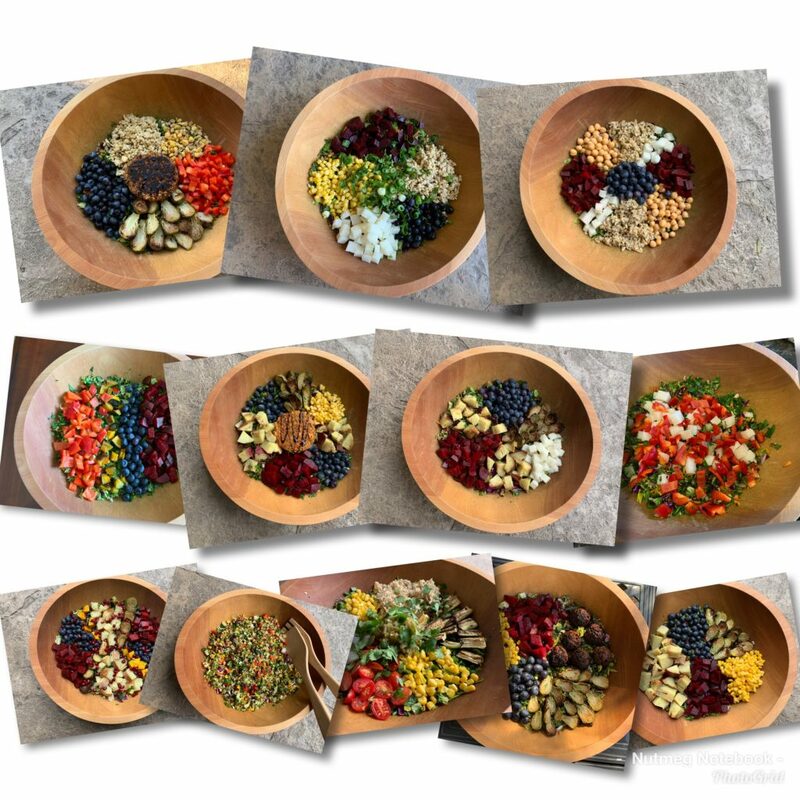 Follow me on my Nutmeg Notebook Instagram and my Nutmeg Notebook Facebook page for many more ideas and different combinations for chopped salads. I post frequently what I am eating. Subscribe to my Nutmeg Notebook YouTube channel for more fun and informative no oil whole food plant based cooking videos. 15 inch solid Beechwood bowl. The Holland Bowl Mill is now the best and largest solid wood bowl production facility in the world, making beautiful solid hardwood bowls of the highest quality, the same way they were made over 150 years ago. 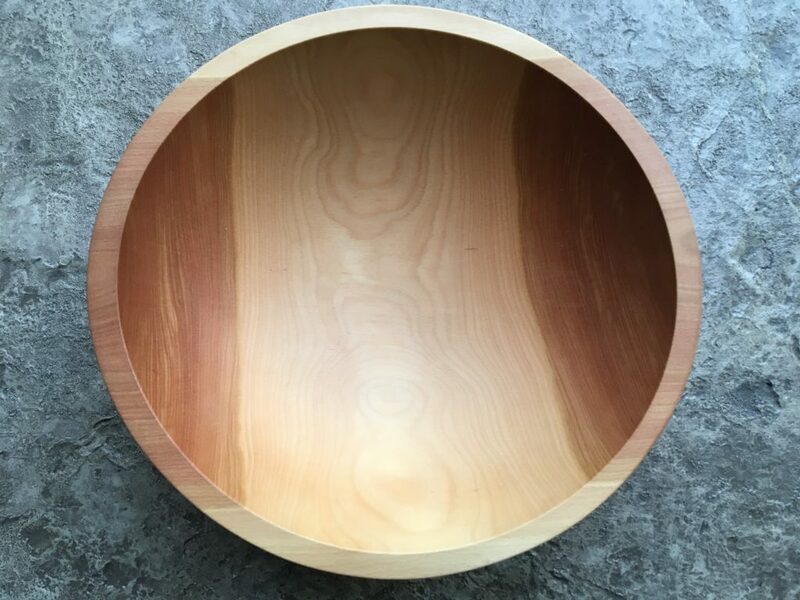 All of their bowls are sculpted from a solid block of wood using a lathe and a series of specialized knives that have been individually designed and forged at Holland Bowl Mill. Before smoothing and finishing, the bowls are steamed to help prevent the wood from cracking and splitting while air drying. After drying, sanding, and smoothing, the wooden bowls are bathed in food-safe mineral oil or their own bees oil wood preserver that nourishes the wood and brings out the beautiful wood grains unique to each bowl. If you prefer not to have the beeswax solution you can ask for your bowl to be sent to you unfinished. No two bowls are exactly alike. The wood bowls do have a lifetime guarantee. You need to continue to oil and care for your bowl to prevent it from cracking. You will get a little instruction card telling you how to care for it. If you use my Holland Bowl Affiliate Link to purchase products from Holland Bowl Mill and have a minimum $125.00 order you will receive a free mezzaluna knife with your order! When you place your order on their website using my affiliate link the free knife isn’t going to show on your order when you check out. However when Holland Bowl gets your order and sees that it came through my affiliate link with a minimum order of $125.00 they will automatically include a free Mezzaluna knife when they ship your order. They have excellent customer service and everyone has received the free knife with their order. 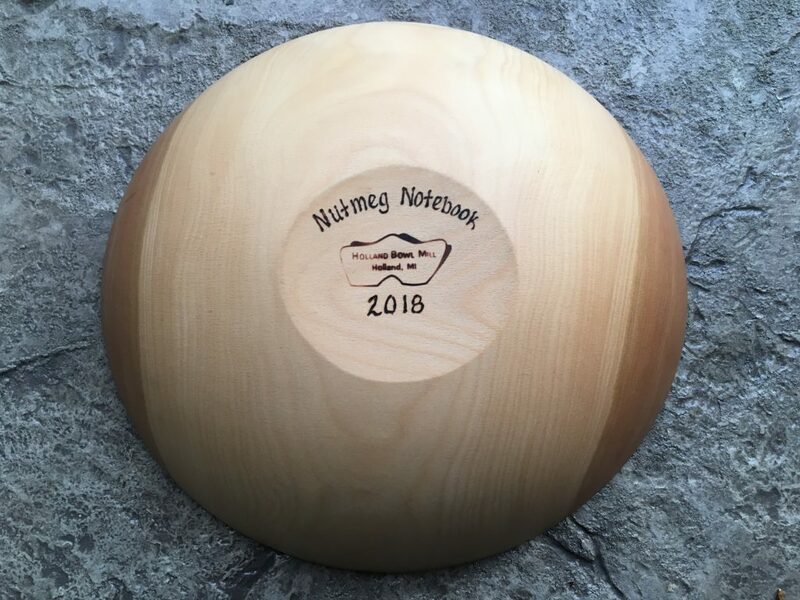 If you want to put in the comments section that you are ordering through Nutmeg Notebook and understand that your $125.oo order qualifies you for a free Mezzaluna knife that’s ok too! Thank you for your support. One of the special services that Holland Bowl Mill offers is to engrave the bottom of your bowl for free! I could have it say Tami’s Kitchen for instance. If giving one as a wedding or anniversary gift you can have it engraved with the couples name and the date. or you could choose a favorite quote. It’s a lovely personal touch. 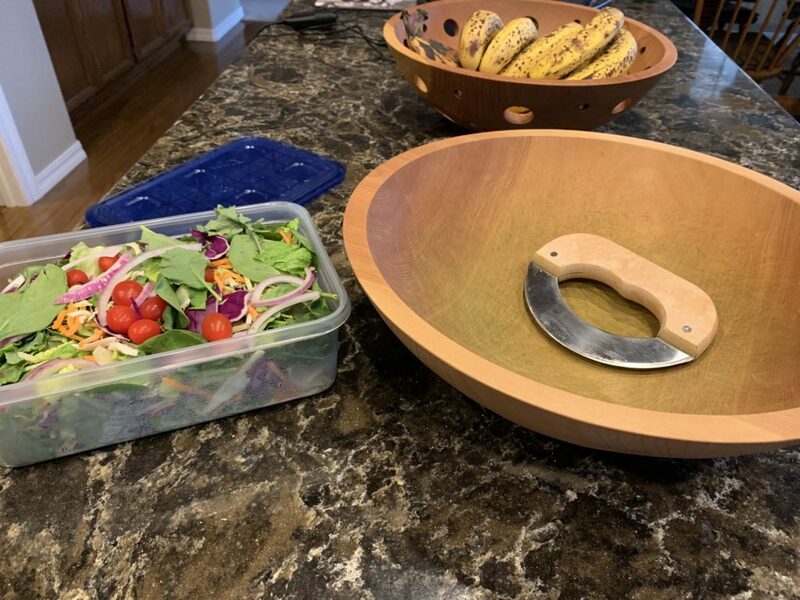 I have found that the 15 inch Solid Beechwood bowl is just the right size to chop my one pound of salad ingredients. The Holland Bowl Mill offers a variety of different wood to choose from. Any of them will work great but I don’t recommend anything smaller than the 15 inch to chop one pound salads like I do. When you are on the Holland Bowl Mill website, click on the Shop tab at the top of the page, from the drop down menu choose the type of wood you would prefer there is beechwood (this is what I have), cherry, maple, red oak and walnut. Scroll down the page until you come to the 15 inch bowl. (Note that the bowl I use is not called a chopping bowl – the largest chopping bowl is only 13 1/2 inches in diameter.) 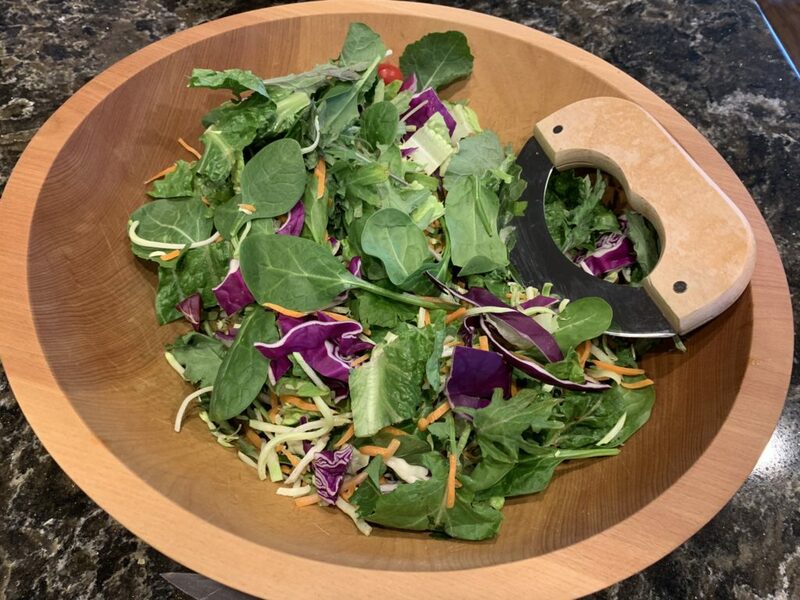 Remember the mezzaluna knife won’t show up on your order but if you use my Holland Bowl Mill Affiliate Link they will include it in your shipment. Be sure to have the bottom of your bowl engraved for free. Happy Chopping! When you purchase items using our affiliate links you help support the work here without any additional cost to you. Thank you for your support. Be sure to check out our Amazon Affiliate Page where we share many of our favorite small kitchen appliances, kitchen tools, food products, books and fun things for the grandchildren! Thank you for your support. Hi Tami, I ordered my bowl through your link and just received yesterday! It’s gorgeous! I’m so excited to get chopping! I did received the free mezzaluna, but I did put comments in on the notes section. I love your name! Congratulations on your new Holland Bowl – may you have many happy years together! Thank you for your support of our work here on the blog. We greatly appreciate it. Just received my bowl and knife today. Can’t wait to get started! What a nice company! And many thanks to you for this information and your amazing blog! outstanding customer service. Chopped salads are such a game changer. Have fun experimenting with different combinations of ingredients. 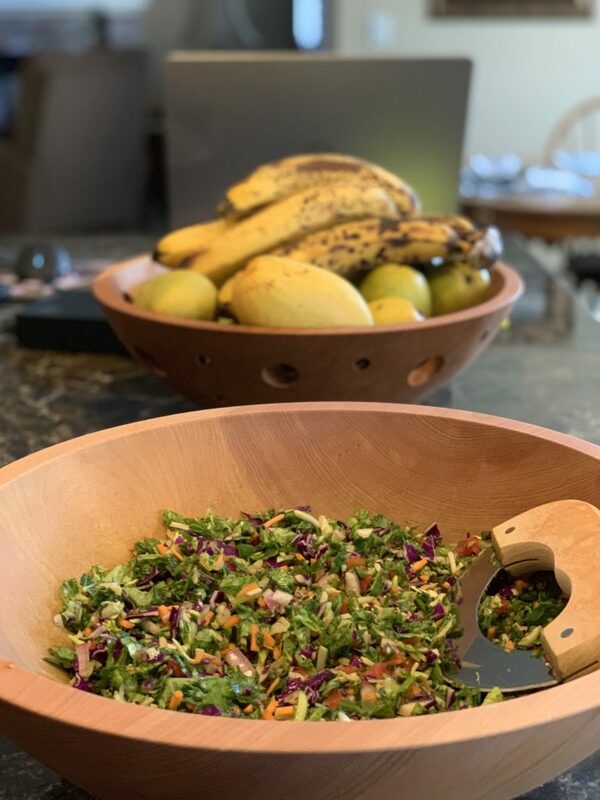 I love my Holland Bowl and my husband Geoff decided he wanted his own, so now we have two! We also ordered the fruit bowl and I am really looking forward to its delivery. I love your posts and all of the great recipes you share! Congratulations on owning not one but two Holland Bowls! They are so useful plus pretty to have sitting in the kitchen. You will love the fruit bowl – not only does it work well to keep the fruit from ripening quickly but it’s a beautiful piece of art work. Thank you for your kind comments – we really appreciate the positive feedback. I love you videos. I subscribe on YouTube and follow you on Instagram. If I just cannot afford the bowl right now, can you tell me another way I could chop my salads? Thank you for the kind comments. 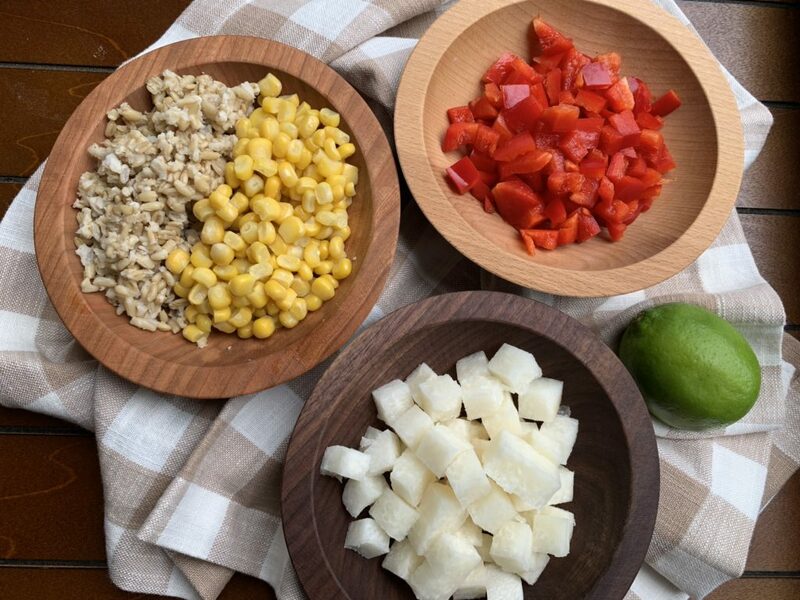 When I first started making chopped salads I had the OXO salad chopping bowl. Here is my Amazon Affiliate link to it. It doesn’t hold a pound of greens at one time so I would just do my salad in batches and it worked pretty good. Some people chop the ingredients on a large cutting board with a large knife. Others tell me they use their food processor using the pulse function and they do it in small batches. Others use kitchen scissors and put everything in a bowl and chop it all up. Some people buy a mezzaluna knife or a Ulu knife and use whatever kind of bowl they have at home but don’t use a SS bowl it will ruin the bowl and your knife. Other’s have found wood bowls at thrift stores – there can be some good buys there too. 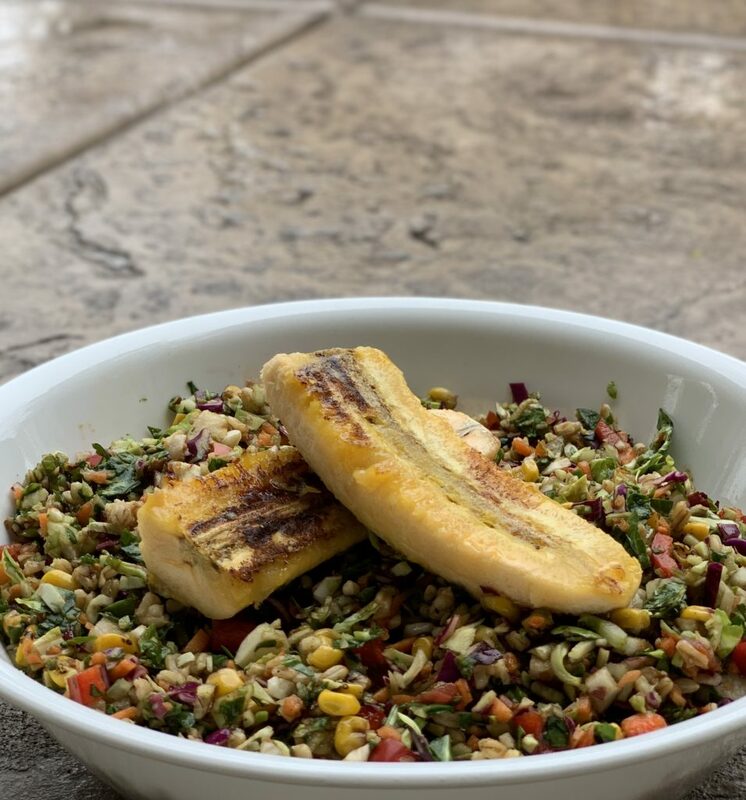 I hope that helps – chopped salads are really delicious so I hope you can give it a try! I am so glad you like your Holland Bowl! Happy Chopping Amy!